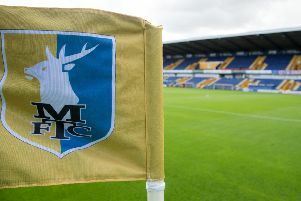 Mansfield Town are back on the road after failing to win any of three successive home games, but that is no bad thing for the Stags, whose away record last season and this is superior to the one at One Call Stadium. Already this season Mansfield have picked up excellent battling wins at Newport County and Leyton Orient. Craig Hignett’s men pulled off a superb 2-1 away win at Yeovil last weekend to end a run of five games without a win, including a 6-1 spanking at Stevenage the weekend before – the club’s heaviest defeat for almost four years. Stags will also have noticed Pools are yet to win at home this season – a record the visitors will hope to extend. Of their meetings down the years, the Stags have won 41 of them, drawn 16 and lost 30. Mansfield have only won once in their last seven visits to Victoria Park, a 4-2 success in 2013/14. Lady Luck continues to kick the Stags in the teeth with another game and another injury last weekend as George Taft pulled up with a hamstring injury. He joins central midfield trio Jack Thomas, Chris Clements, and Adam Chapman on the sidelines as well as fellow centre half Kyle Howkins. Striker Danny Rose will soldier on with a mask protecting a fractured eye socket as Stags head north with just 15 fit outfield players. Shearer; Bennett, Iacovitti, Pearce, Benning; Collins; Mitch Rose, Clements, Hurst; Danny Rose, Green. Pools are sweating on centre-back Rob Jones who came off at half-time at Yeovil with back trouble. Craig Hignett will probably start with the side which he sent out for the second half at Huish Park and operate a 4-3-3. Carson; Magnay Nsiala, Harrison, Donnelly; Featherstone, Laurent, Hawkins; Alessandra, Amond, Thomas. Subs (from): Bartlett, Richards, Bates, Carroll, Deverdics, Woods Paynter, Heardman, Fewster. Craig Hignett believes he has the best two keepers in League Two at Hartlepool United in Trevor Carson. And given the way Pools have begun the season, conceding 16 times, a good goalie is vital and Carson fits that bracket. A good shot-stopper, the 28-year-old, who was on the bench for Northern Ireland in their World Cup qualifier in the Czech Republic, claimed an assist last week at Yeovil, setting up Nathan Thomas’ first goal. Matt Green will be desperate to add to his three goals so far after failing to find the net in the last two games at home. Mansfield fans will recall his bits of trickery for the Stags, but the 21-year-old is now a consistent performer since going home to the North-East. An automatic selection for Pools, the Teessider has now added goals to his game, scoring five last season with his new club and three this time. His double at Yeovil showed him at his best. Thomas displayed speed and a cool head to draw Pools level from a route one punt but his injury-time winner was special, cutting in from the right side before beating Artur Kysiak with a curling left-footer which gave the keeper no chance. On the outside, Hignett is a chirpy Scouser with a love of attacking football, carried from his days at Crewe Alexandra. But don’t let the warm exterior fool you, inside beats a determined and focused manager, who is at Hartlepool United to make a name for himself. Previously a youth coach at Middlesbrough’s famed Academy, the 46-year-old has spent the last few seasons as assistant to Colin Cooper at Pools and Aitor Karanka at Boro and is now in his first full-time main role and he’s hungry for success. Pools have blown hot and cold to date. Aside from the 6-1 humiliation at Stevenage, the away form has been good, taking seven points from 12, but at home, it’s only two out of nine and that can’t continue. Boss Craig Hignett’s expectations were high going into the season. His target will be top seven, but many fans will be happy with top half/ top 10 after a few seasons of serious flirting with the bottom two. The first half was all about former Stags winger Nathan Thomas, now at Pools, who caused problems galore for his former club – and angered the travelling fans in the process. The Stags could be proud of their efforts at Victoria Park – Colin Daniel levelling at one point in the second half – but they left disappointed. To get to Victoria Park: Exit the A19 at signpost Hartlepool A689, Motorway A1(M). At roundabout turn right (s/p Hartlepool A689) and continue on the A689 for 4.3 miles, through the village of Newton Bewley, to the roundabout by the Owton Lodge pub. Go straight on (signposted Town Centre A689) and follow Town Centre signs for 2.8 miles, over two roundabouts. At the traffic lights just past the Blacksmiths Arms on your left, go straight on. At the next traffic lights go straight on again over the bridge into the new marina complex and straight on again at the roundabout into Marina Way. This is the area for the Jackson’s Wharf parking. To get to the ground itself continue to the next roundabout and turn left (s/p The North A179, A1048). Hartlepool have allocated Mansfield fans 220 tickets in the Smith & Graham Away Stand, which are now on sale from the ticket office on Quarry Lane until 3pm on Friday. Prices are: Adult £20, Senior £10, Armed Forces £10, Student/U19 £10, U16 £10. Ambulant disabled supporters and wheelchair users are required to purchase a ticket in the relevant category. However, they will receive a free carer ticket if they are in receipt of the higher disability allowance, for which documentation must be provided. Supporters will be able to purchase tickets on the day of the game from the Hartlepool United ticket office, with no price increase. Please note, there are no cash turnstiles at Victoria Park and tickets must be purchased in advance from One Call Stadium, or from the Pools’ ticket office on the day of the game.